Synopsis: Children are innately curious about words, especially phrases that make them laugh ("Ants in your pants! "), sound silly ("Barking up the wrong tree" or "Goosebumps") or trigger images that tickle a child's sense of the absurd ("Like a bull in a china shop"). 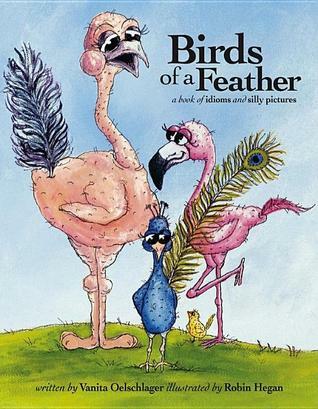 Birds of a Feather introduces children to the magic of idioms words that separately have one meaning, but together take on something entirely different. Birds of a Feather introduces idioms with outlandish illustrations of what the words describe literally. The reader then has to guess the "real" meaning of the phrases (which is upside down in the corner of each spread). At the end of the book, the reader is invited to learn more about these figures of speech. Review: If I could give this book more than five stars I would. The illustrations were funny and well done. Each idiom was explained in a way that children could understand. I'll definitely be buying this book for me and my friends. Parents and children alike will love this book.